Chop apples into bite sized cubes and mix together with Fat Toad Farm Goat’s Milk Caramel. Cut each French Toast in half and serve. Drizzle with more delicious Fat Toad Farm Goat’s Milk Caramel Sauce for some added love and sweetness! Preheat oven to 350 F. Lightly grease a 13in x 9in/33cm x 23cm pan then line the base and sides of the tin with a large sheet of parchment paper, pushing it into the corners. Make a small diagonal snip in each corner of the paper; this helps to fit the paper snugly into the corners of the tin. Place the egg whites in a large bowl and whisk until stiff but not dry. If you turn the bowl upside down, the whites should be stiff enough not to fall out. Put the egg yolks in a separate bowl with the sugar and whisk using the same whisk (no need to wash it) on high speed for 2-3 minutes or until thick and creamy and the mixture leaves a thick ribbon-like trail when the beaters are lifted. Pour in the cooled chocolate and gently fold together until well combined. Gently stir two large spoonfuls of the egg whites into the chocolate mixture to loosen the mix, then, fold in the remaining egg whites using a large metal spoon (you don’t want to squash out the air you have just beaten in). Sift the cocoa over the top and lightly fold it in. Pour the mixture into the prepared tin and gently move the tin around until the mixture is level. Bake in the preheated oven for about 20-25 minutes until risen and the top feels firm and slightly crisp. Remove from the oven, leave in the tin (it will fall and crack a little) and set aside until cold. Whip the cream until it just holds its shape. Lay a large piece of parchment paper on the work surface and dust it lightly with powdered sugar. Turn the roulade out on to the paper so its lining paper is on top, then, carefully peel off the paper. Spread the goat’s milk caramel on the roulade and then follow that with the whipped cream, leaving a border of about ¾ in all the way around the edges. With one of the shortest edges facing you, make a cut along it with a sharp knife, going about half way through the sponge. This will help to start the rolling up. Now roll this cut edge over tightly to start with and use the paper to help continue the tight rolling, by pulling it away from you as you roll. 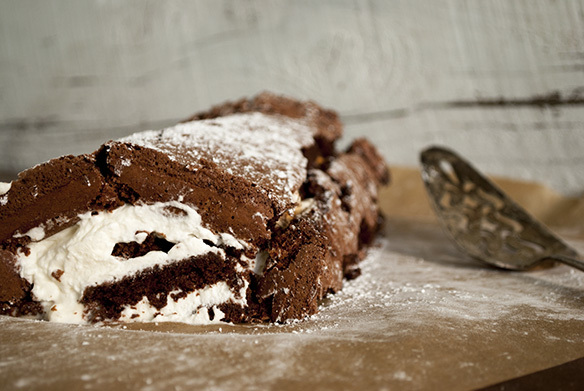 Don’t worry if the roulade cracks – that is quite normal and all part of its charm. 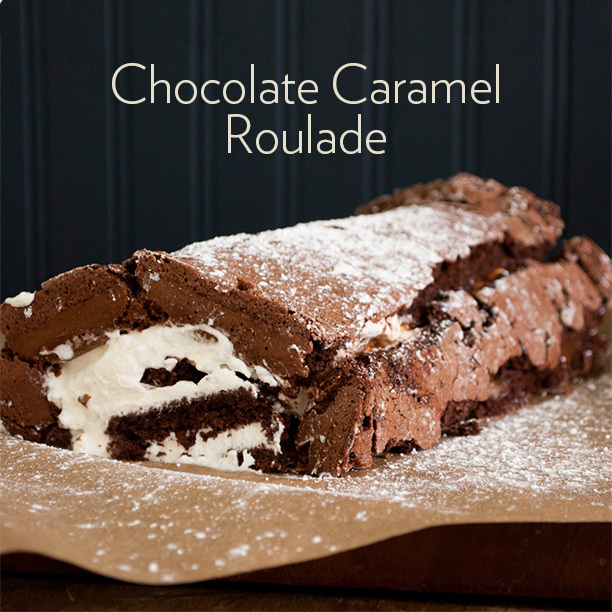 Finish with the join underneath then lift the roulade onto a serving plate or board using a large wide spatula. Dust with powdered sugar. Preheat oven to 425°F. Roll out puff pastry on a lightly greased baking sheet. Place cheese in the middle of puff pastry and create a small indent in top of the cheese with a spoon. Fill indent with caramel, then bundle puff pastry up and around cheese. Lightly brush pastry with egg mixture. Bake for 20-25 minutes. Let cool for 5 minutes before serving with your favorite crackers or French bread. Enjoy! Directions: Combine caramel & milk in a saucepan over low heat, whisking constantly until just mixed, 1-2 minutes. Mixture should be just lightly warmed but if it’s hot allow to cool to room temperature before next step. Beat yolks in a large mixing bowl. Gradually add milk & caramel mixture and beat until it starts to thicken. Whisk in rum and vanilla extract. Pour into a large punch bowl and chill for 1-2 hours. Fold in whip cream before serving. Garnish with freshly ground nutmeg. Serve and enjoy! In a small saucepan, cook and stir chocolate and butter over low heat until melted and smooth. Remove from heat; cool slightly. Preheat oven to 325°. Line a 13 x 9 x 2 inch baking pan with foil, extending the foil over the edges of the pan (or use two smaller pans). Grease foil with a little olive oil. In a small bowl, stir together flour and ¼ cup cocoa powder. In a large mixing bowl, stir together sugar, finely ground coffee, cayenne, and cinnamon. Add chocolate mixture. Beat with an electric mixer on medium for 1 minute, scraping the sides of the bowl occasionally. Add eggs, one at a time, beating on low speed after each addition, until just combined. Beat in vanilla extract. Gradually beat in flour mixture until just combined. Beat on medium speed for 1 minute. Pour batter into prepared baking pan, spreading evenly, about 1 ½ inches thick. Bake for 35 – 40 minutes of until edges start to pull away from sides of pan. A knife stuck in the middle should come out clean. Cool in pan on a wire rack. Lift brownie out of pan with foil edges and remove foil. Top with powdered sugar and drizzle with Fat Toad Farm Goat’s Milk Caramel Sauce! Generously butter eight 6 ounce ramekins or custard cups. For filling, over a double boiler (heat safe bowl over steaming water) combine 1 cup chocolate pieces, whipping cream, and 1 tablespoon butter. Stir over low heat until chocolate is melted and mixture is smooth. Cool for 15 minutes, stirring occasionally. Cover and chill for 2-3 hours or until mixture reaches a fudge-like consistency. Preheat oven to 375F. In a double boiler combine ¾ cup chocolate pieces and ½ cup butter. Cook and stir over low heat until chocolate is melted and mixture is smooth. Cool slightly. In a large mixing bowl, beat eggs and sugar with an electric mixer on medium to high speed for 5 minutes. Beat in flour and slightly cooled chocolate-butter mixture. Spoon enough batter into each ramekin to measure 1 inch in depth. Divide chilled filling into 8 portions. Working quickly, use your hands to roll each portion into a ball. Use your thumb to make a shallow indent. Place a ball of filling on top of the batter in each ramekin; do not allow filling to touch sides of ramekins. Spoon a tsp of caramel into indent. Spoon the remaining batter into ramekins, spreading over balls of filling. Bake for 15 minutes. Remove from oven; let stand for 10 minutes. Using a knife, loosen cakes from sides of ramekins. Invert onto dessert plates. Serve immediately. Drizzle with Fat Toad Farm Goat’s Milk Caramel. If desired, serve with small scoops of ice cream. Makes 8 individual cakes.